SEEFAR RUBBER PLASTICSS mechanical PTFE seal rings are made from either our own compression molded virgin PTFE or filled PTFE materials to the user's exact specifications up to 62" in diameter on our 1250 ton press. Typically used for critical applications, SEEFAR PTFE seals are ideal for use when corrosive liquids, high pressures or distinct pressure variations are present. Custom large and small diameter seals will ensure minimal maintenance downtime and repair. Our custom PTFE seals are self lubricating and have a long service life due to the material retaining its original properties over a long period of time, even at extreme temperatures, in ultraviolet (UV) light, and when exposed to oils, oxidizing agents and solvents. 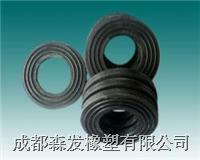 PTFE is also extremely corrosion resistant, especially to acids and harsh inorganic and organic chemicals. Additionally, the original properties of PTFE remain the same even after extended periods of exposure in salt water. Plastomer also offers seals machined from PPS, Acetal, PEI ,PEEK or other specified engineered plastic materials. Material selection assistance is available to ensure the optimal material or PTFE compound is being used for extreme operating environments. Our seals are typically used in critical industries such as aerospace, automotive, chemical and offshore.